How likely are you to win an election, if your base and your candidate represent less than 4% of the electorate? The establishment would have us believe that Trump is SO bad that whatever Democrat wins the nomination in 2020 will be able to beat him. Furthermore, if the Dems nominate a Wall Street Corporatist Centrist and that candidate loses in 2020, furious blame will be placed on people who either refuse to vote for the Wall Street Corporatist Centrist, or who just stay home altogether on voting day. It will be a replay of 2016 all over again. Who wants that? Read me now, quote me later: no candidate who has the support of Wall Street and the Corporate Establishment can beat Trumpism. That's based on numerous polls and history itself. The COMMON DREAMS article cited at bottom has links to the most recent poll in question. 1) Left Populists– very concerned with wealth inequality and the abuse of power enjoyed by the economic elites who have rigged our system in their favor; lean left on social issues. 2) Nativist Populists- very concerned with wealth inequality and the abuse of power enjoyed by the economic elites who have rigged our system in their favor; lean right on social issues. 3) Arch Conservatives– lean right on all issues. 4) Socially Liberal/Fiscal conservatives– lean left on social issues, lean right on fiscal issues. If you watch or read corporate media like NBC, ABC, CBS, MSNBC, CNN, Fox, NYT or WaPo, you are told that Left Populists are a small, extreme group, very dangerous because they threaten to lead the Democratic Party away from victory in 2020. At the same time, you are assured over and over again that Socially Liberal/Fiscal conservatives are the safest leaders, charting a sensible middle-of-the-road course that will bring us practical, albeit incremental change. Clearly, this middle-of-the-road group is the one most Americans identify with, right? Everyone inside the Washington Beltway and Media Power Circle agrees. Certainly most Democrats in America fall into this category, right? Add #1 and #2 together and nearly three-quarters of all voters fear runaway inequality as their greatest concern. What differentiates them is identity politics. Hmmm…. Who uses identity politics to keep voters divided? Alarmingly, add #2 and #3 together and Trump (or Trumpism) has a very good chance of winning in 2020. The other thing you should notice is how small Group #4 is. No, your eyes do not deceive you. Group #4, which the establishment wants you to believe is very large – the group that MUST be catered to, by anyone who wants to win in 2020 – is, in fact, absolutely miniscule. Group #4 is less than 4%. But, you ask – "If it is so miniscule, why do all the pundits say it is so important?" Because however small Group #4 is, it nevertheless contains a majority of our elected politicians in Washington, a majority of all political consultants, nearly 100% of all corporate media personalities from Whoopi Goldberg to Rachel Maddow to Joe Scarborough and everyone inbetween, and nearly 100% of the wealthy DONOR CLASS. Call them the Bubble Elites. They live in a tiny bubble, socialize in it, and work in it. They are a tiny fraction of the US population, but ensconced so comfortably in their own little bubble, they think THEY are "the world." Is it any wonder Trump is president? It is vital for the rest of us to realize that the group-think pumped out of Washington and the corporate media is dangerous, in that believing it can lead us farther down a very dark path. JFK said that a system that makes peaceful revolution impossible makes violent revolution inevitable. That Bubble Elites don't want violent revolution. But neither do they want peaceful revolution. The Bubble Elites don't want change, period, except the most incremental change, change that will not disturb their comfortable status quo. If they have their way… violent revolution WILL be inevitable. There is nothing practical or sensible about nominating a candidate who represents a base of less than 4% of the electorate. On the contrary – that would be a disaster. It really will be 2016 all over again. There is a clear way to avoid a Trumpism Redux – nominate a progressive populist. By that, of course, we mean a real progressive, not a slick, calculating politician who only started talking like in progressive in 2017 when they suddenly switched their voting pattern and began voting in lock-step with Bernie Sanders (we see you, Cory, Kristen, Kamala…). Voters under age 50, who do not watch cable news and therefore are not drinking the constant flow of propaganda pumped out by the establishment, will not be fooled by ambitious politicians who say anything to get elected. This is why Bernie Sanders is the ONLY candidate who can defeat both Trump and Trumpism in a landslide in 2020. Three quarters of the electorate share his concern with rampant wealth inequality. People BELIEVE him when he talks, because he has consistently walked the walk. In case you missed it on Tuesday night, please watch Bernie's SOTU rebuttal. He provides vision, leadership, and a POWERFUL NARRATIVE, something absent from too many in Washington. Listen to his repeated riffing on "We are not free when..."
It's poetic, it's inspiring, it's moving, and it's TRUE. He completely demolished Trump's use of the word. THAT is a great rebuttal. Bernie owns Trump in that speech. Such a soothing political word. It conjures up a reasonable, considerate person who seeks the middle ground between ideological extremists: Works well with others, crosses the aisle to make good policy, knows how to win incremental change rather than issuing jarring proclamations that jump too far ahead of the electorate. A moderate is pragmatic, gets things done and doesn't let the perfect become the enemy of the good. Oh, in these troubled times, aren't such moderates—beloved as they are by right- wingers like Bret Stephens—desperately needed? Get ready to hear more and more of that from mainstream media pundits as the Democratic Party moves more towards the kind of progressive populism put forward by the Sanders/AOC wing of the party. We'll be asked by centrist journalists to take a careful look at more reasonable moderates like Gillibrand, McAuliffe, Bloomberg, Biden, Booker, Landrieu and many more (e.g. "Is There Room in 2020 for a Centrist Democrat?" and "The Loneliness of a Moderate Democrat"). But what is the substance of all this centrism and moderation? First and foremost, these moderates are united by their unwillingness to take on Wall Street. And because of that unwillingness, they are unable to confront the defining problem of our era—runaway inequality. They cannot face up to the fact that the wages of the average worker have been stagnant for an entire generation. Meanwhile the pay gap between the top 100 CEOs and the average worker has risen from 40 to 1 in 1980 to an obscene 800 to 1 today. The centrists run away from this problem in large part because they are in a desperate race to win the very first primary—the fundraising primary. And it is no secret that victory goes to the candidate who garners the most financial support from Wall Street/corporate Democrats. Rather than discussing runaway inequality and ways to ameliorate it through Medicare for All, free higher education, and higher taxes on the super-rich, these moderates instead will stress enhancing "opportunity," and "removing barriers" to race/gender advancement. Rather than confronting billionaire oligarchs they want to "partner with business" and, in some vague way tame their excesses while also building a robust and fair economy with "opportunity for all." No conflict needed. No diatribes against the billionaire class. Hear the melodious tones of moderation. From this coziness with Wall Street flows the trope about being "socially liberal" and "fiscally conservative." The moderate centrists, and their Wall Street donors, support LBTQ rights, the advancement of women in business, immigration and criminal justice reform, gun control, and abortion rights. At the same time, they believe the entire progressive runaway inequality platform is an affront to economic reason: High taxes on the rich will discourage initiative and innovation; single-payer health care and free higher education will bankrupt the country; breaking up the big banks will cripple investment and jobs. Of course, the moderates must ignore the reams of data from all over the world that show that these progressive reforms would reduce inequality and enhance the well-being of nearly everyone, though it is true that reducing inequality would harm—at least to some extent —the precious privileges of the very few. The super-rich would have to pay more. They would no longer be able to financially strip mine the rest of us through wasteful stock buy-backs. Their billions would be reduced a bit. But most alarming would be their deflated egos: No longer could they bask in the false narrative that what is so very good for them is good for all of us. But do "moderates" represent anyone other than their Wall Street donors? Is there a mass base for the kind of moderation they are putting forward? Let's take a look at the eye-popping data from the 2016 presidential election, put together by the Voter Survey Group, which polled 8,000 Americans (a very large sample which is eight to fifteen times larger than most of the surveys we usually see in the news.) A study of these voters showed that they could be divided into four major groups. (See Lee Drutman, "Political Divisions in 2016 and Beyond." Note: the title names used below are mine not his.).
" The first group, Left Populists, are those who are both social and economic progressives. They support immigration, women and minority equality, LBGTQ rights and immigration. They also worry about rising inequality and support proposals that would attack it.
" The second group, Nativist Populists, also worry about rising inequality and support proposals that attack it. But they are more comfortable with traditional gender roles, have qualms about abortion, see immigration as a problem and are not particularly supportive about LBGTQ rights.
" The third group are the Arch Conservatives who are not interested in reversing economic inequality or social inequality.
" And finally we have the Socially Liberal/Fiscal Conservatives. This is the home base for the "moderate" politicians who are wooing Wall Street and see themselves as the sensible alternatives to the extremist populists.
" 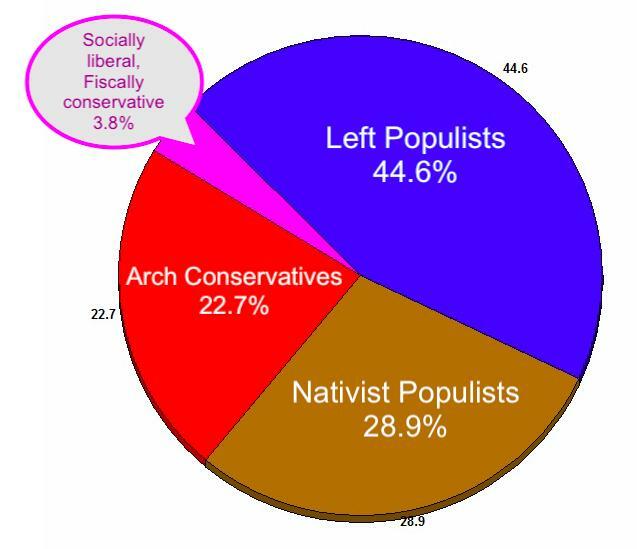 Left Populists account for 44.6 percent of the electorate according to this study.
" 28.9 percent are Nativist Populists. This means that nearly three-quarters of all voters fear runaway inequality and want to reduce it. But these economic populists are divided on identity issues.
" Arch Conservatives account for another 22.7 percent.
" And that leaves a miniscule 3.8 percent for the Socially Liberal/Fiscal conservatives. How pathetic is that? It goes to show how out of touch these billionaires and their accolades are from political reality. They have no base. Nada. There's no one there... except very rich Wall Street/Corporate funders and centrist pundits who feel compelled to find a judicious balance between left and right. The data shows why Trump's nativist, race- baiting, immigrant-bashing base-building makes some electoral sense. If he can hold both the Nativist Populists and the Arch Conservatives he can win again. And he can do that most easily against a candidate with virtually no natural base—the "moderate"—the Socially Liberal/Fiscally Conservative Democrat. Given enough financial support, a "moderate" might be able to buy her or his way through the Democratic primaries, especially if many candidates split the progressive populist vote. One could imagine one of the "moderates" becoming a media darling of the center, which might further enhance his or her status. But should one of them squeak through to become the nominee, we might have a Democratic debacle. The nativist economic populists on the right might flock back to Trump along with the arch conservatives who will never leave him. Trump may look incredibly weak now, but a Wall Street-backed Democratic "moderate" with a natural base of 3.8 percent could give the worst president in American history a real chance. Jim Hightower, the great Texan populist, turned a phrase that comes to mind every time a Wall Street "moderate" is touted. "There's nothing in the middle of the road," he famously quipped, "but yellow stripes and dead Armadillos." Joe Manchin and his ilk, on the other hand… are Dead Armadillos. A very, very small group. They DO have "the money." But Bernie and AOC have the people.